Edward Bright was born in 1721 and was a post boy in his youth riding daily to Chelmsford. He later became a candle manufacturer and grocer and the house and shop of which he was a tenant still stands in the High Street immediately to the east of the Plume Library. Now known as Church House, it was built about 1700. 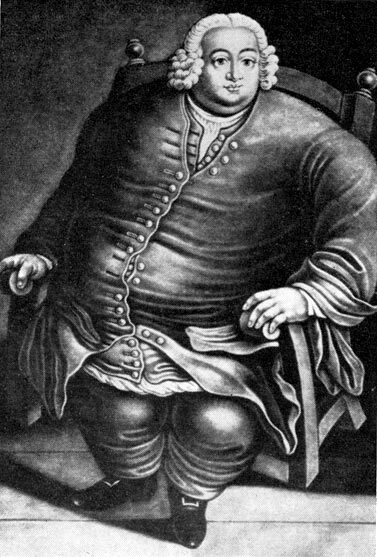 When he died on 10th November 1750, at the age of just 29, Bright was thought to be the 'largest man that had ever lived in this Island'. The last time that he had been weighed when he was 28 his weight was 584lbs or nearly 42 stones. He measured 5'9" in height and round the chest measured 5'6" and the stomach 6'11". No wonder that at the end of his life it was written 'his corpulence so everpower'd his strength that his life was a burden and his death a deliverence'. You can change your mind and alter your consent choices at anytime. See bottom of page for how to do that.